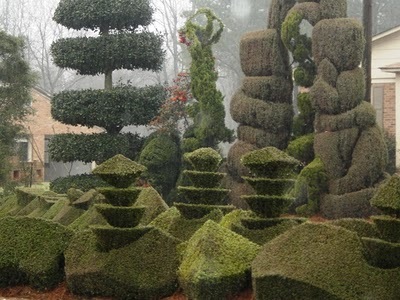 I just watched a documentary called A Man Named Pearl about Pearl Fryar and his topiary garden in South Carolina. It was a fantastic glimpse into the life of a man who is completely in tune with himself and his passion in life. His passion for topiary has brought him, his neighborhood, and his community a burst of energy and hope. In the past I would have been a bit jealous of Pearl for discovering his life’s work and pursuing it. Just a couple of months ago it seemed like my life’s work was to sit on a recliner and maybe watch some tv. That wasn’t very fulfilling. Now, though, when I can anticipate 50 weeks of new experiences stretching before me, it almost seems possible that my passion could be out there waiting to be discovered. I’ve been enjoying poking around the internet looking for project inspiration and reading the blogs of other crafters. I’m impatient to get started! Thanks again for the encouragement you have offered so far. I know I’m going to need it as I embark on this journey in the coming year. I’m not usually a very ambitious person, so the long empty project list on my desktop is at times a little intimidating. If you have spotted any great projects out there please send them along. Thank you all for the great feedback on my preview project. I’m looking forward to starting this blog in earnest at the beginning of 2011. I hope you’ll come back to see the projects I’ll be working on! My husband loves his new bedside table! I like mine, too. I still can’t quite believe that I built them. I’m looking forward to 2011 so I can tackle more projects and see what else I can do. 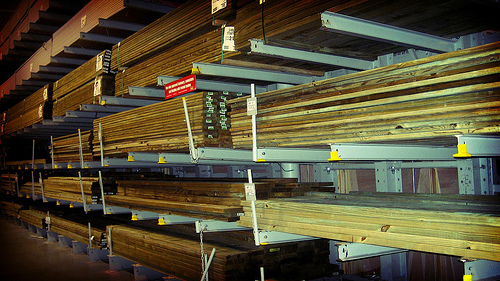 – Making one trip to the hardware store before the beginning of a building project may not be the best idea. I wasted money on supplies I didn’t need and made mistakes because I didn’t make time to buy the right stuff toward the end. – Having the right supplies and tools on hand makes for a smoother project. – Take the time to get it right. Measure and measure again, read equipment manuals, don’t cut corners. – Don’t be afraid to take (or leave) the advice of others. – Helpful people are awesome. – Don’t be afraid to fail. Don’t give up. The breakthrough moment will come and things will never be as bleak again. With the basic boxes built it was time to turn my attention to finishing work. I knew that I wanted to stain them and that they should at least somewhat match the existing wood dresser in my bedroom. Aside from that I really hadn’t given much thought to what these side tables would look like when they were done. While I was building I just followed a plan, but when I let myself think about the finished product I felt like I could finally be creative. Step one was staining the bookcases inside and out. I chose a color called Ipswich Pine by Minwax which was a nice warm yellow (see the before and after above). Ana recommends filling the screw holes first, but I had a different plan for those. I ripped the leftover birch plywood I’d used for the backs into 2 inch strips and covered the screw holes with them, then framed the sides out in a pseudo-mission style. Finally I filled the nail holes and stained the whole thing. It turned out pretty great! It’s subtle, but the edge trim really finishes off the shelves nicely. Finishing these shelves was so much easier than building them, but it took just as much time. I was surprised at how quickly the time went by this week! Soon I’ll run by the woodshop with my husband’s car and bring the bookshelves home so he can get them as Christmas presents. Come back tomorrow for the final reveal and lessons learned. I arrived at the woodshop at 10:30 Monday morning armed with my freshly cut plywood, my printed plan, and my hopes and aspirations. The goal was to build two small bookshelves to be side tables for my bedroom as a gift to my husband for Christmas. I was getting a late start since I had hoped to begin the build on Sunday, but a whole free day stretched before me and Ana makes it look so easy. I was confident I could get the boxes constructed in no time. By noon I found myself taking a lunch break out of sheer frustration. Everything seemed to be going wrong. Even with the help of friends and strangers in the woodshop I just could not figure out how to get the first two pieces attached to each other. Getting them to be square seemed like a distant dream. Finally a friend suggested I build a square jig and clamp the pieces to it (you can see my jig in the photo above). That worked! My next challenge was to get all of my helpfully pre-drilled holes to line up. That part didn’t quite work. I ended up resizing some pieces to fit my holes instead of the other way around. Even so, the few screws that I hadn’t stripped were coming up through the bottoms of my first boards. At this point in the day I fitfully declared that I should have called this blog “Learning to Fail” and just about gave up. Fortunately, it was at this point that a helpful fellow woodworker recommended that I switch to a less powerful driver to use on my screws. He suggested one with an adjustable clutch. I don’t know why this worked, but it seemed to be the key to everything. With the tools you see above I managed to assemble the box portion of the first bookshelf by about 4 o’clock. Putting on the trim went much faster thanks to another helpful woodworker who let me use his pneumatic nailer. That was fun! I felt like a professional as I quickly attached my trim pieces and the backing board. Energized by these successes I completed the entire second shelf in just an hour and a half. For those of you keeping score that’s 6 1/2 hours for the first shelf and 1 1/2 hours for the second. I was home by 8pm. Next step: covering my many holes and staining both shelves. I had originally thought that I would buy my materials for this project on Saturday so I could use Sunday afternoon to get the bookshelves started. The plan I was following by Ana White stated that these were smaller than a previous plan which had used one sheet of plywood for two bookcases, so I was certain that I would only need a half sheet. In fact, I was so certain that I didn’t draw it out but went right into Lowe’s like I knew what I was doing. An hour and much frustration later I left with nothing. I went to three more stores in search of wood that day and left empty-handed. On Sunday I spent some time mapping out the size pieces I needed and, armed with knowledge, went back to Lowe’s. I had confirmed that I would only need one half sheet of plywood plus some 1x2s, and I knew that I wasn’t looking for the nicest cabinet grade wood they had. However, the salesperson told me that I would need to buy a whole sheet of plywood even if I only needed a half sheet. I left Lowe’s and went to Home Depot, where I was sure I had seen half sheets of the wood I needed the day before, but I was wrong. Eventually a kind (and only slightly exasperated) employee there told me that I really would be better off buying a whole sheet rather than piecing the project together out of other sized wood. I was beyond frustrated and eager to get started, so I took his advice and bought a full sheet of plywood. I saved money by buying furring strips instead of expensive 1x2s, though the quality wasn’t what I really wanted for my shelves. I wanted so badly to be done shopping that I bought them anyway. Slightly over budget and with some materials remaining on my list, I left the store and brought what I had to the woodshop. Sunday evening I fired up the table saw for the first time and cut the plywood into pieces according to Ana’s plan. My first attempt was 1/4″ short, so that piece immediately became scrap. I was beginning to see the wisdom in buying more wood than I needed. When I was done that night I had a tidy pile of wood that matched Ana’s diagram, a good amount left over, and a new boost of confidence. That boost of confidence dissipated on the drive home as I realized that I’d purchased enough plywood to dispense with the furring strips entirely (money waster #1), and without the furring strips in the plan I had cut my tops an inch and a half too narrow. Oh well. Tomorrow would be another day — one that would be filled with actual building. Onward! It has been my plan for the past few months, ever since I dreamed up this crazy blog, to start it in January and do a craft project per week in 2011. But of course just thinking about the blog was enough to encourage me to start a few projects. A couple of months ago I picked up a long dormant knitting project again which you will hopefully see as it nears completion. And yesterday, with just two weeks to go before the official start of the blog, I couldn’t help myself and started a building project for the first time. This week will be a bit of a preview of what is to come in 2011. I don’t remember how I first found Ana White’s blog, Knock-Off Wood, but her building plans were a revelation. It had never occurred to me that I could build my own furniture before. I immediately began dreaming of the pieces I would build and where in my little townhouse I would put them. That was over a year ago and this weekend I finally started work on one of her plans. Join me throughout the week as I share my sometimes frustrating, sometimes triumphant experiences shopping for wood, using power tools, and building and finishing furniture — all for the first time (and hopefully in time for Christmas). You are currently browsing the 50firstcrafts blog archives for December, 2010.